StP Vasouy M.K.B, 9./M.A.A.266, StP Gruppe Trouville, K.V.A.'G'. M.K.B. Battery Vasouy 9./MAA 266 with three 15cm guns in Marine emplacements 272 and an M 262 fire control post. M.K.B = Marine Küsten Batterie. M.A.A. = Marine Artillerie Abteilung. 9./MAA 266. Marine Artillery Abteilung, Marine Küsten Batterie. 1 x M262 fire control post for a light battery. 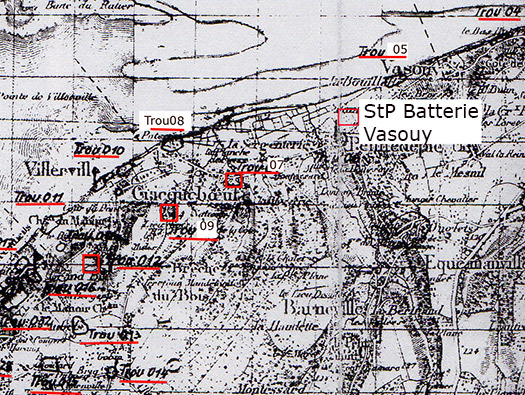 The German plan of the area showing all the defence positions north of Trouville. The D513 from Honfleur to Villerville is very busy but there is a lay by (parking) on the opposite side of the road near the gate. Plan of the battery area. Red : is the Fire Control Post PDT. White - the M272 casemates. Two complete and one very damaged casemate. Just entering the field via the gate where there is a concrete base for a hut or such like. Air photo showing the battery site.. This is one of the best preserved M262's, it was never as far as I can see fired on or bombed. 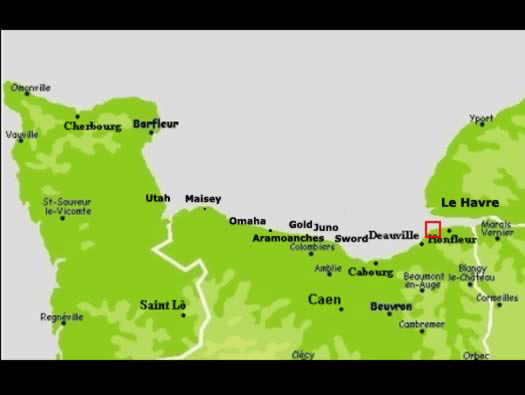 As the allies advanced the battery's crew retreated north and crossed the Seine. The entrance into the range-finder room. The rear entrance into the range finder room. Range-finder room. The concrete raised base is for a range-finder to stand on. 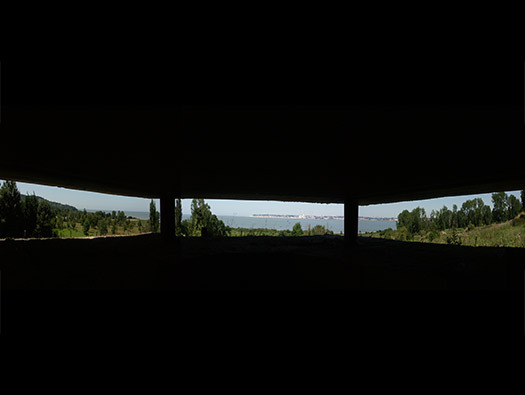 The view across towards Le Havre and the E-Boat pen. Range-finder room a better view. 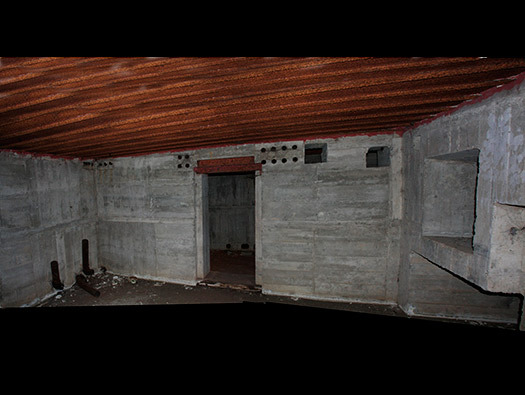 Some of the wood shuttering is still in place and also it looks as though the work on this M272 was very hurried by waste concrete not removed. Range-finder room at the rear showing where it has been partly filled in. Camouflage netting hooks made from the re enforcing rods bent over. Putting on the camouflage nets. The entrance to the computing room. Close combat embrasure in front and below a space to pass equipment. The niches in the walls either side are for light switches and the slots are for telescopic aerials. Lights switch inside its niche. Aerial fitted into its slot. Drain in the floor, remember its their when you walk into a bunker they nearly all have one. Zinc drain bowl to catch large items. Plan of a bunkers drainage. Passing through the gas lock. This is my opinion but I think that many if not all the metal fittings had not been installed. It looks as though it was a hurried build and may have been up and ready after Christmas 1944 not August 1944. 19P7 door that should have been here, I am not sure if they were fitted. 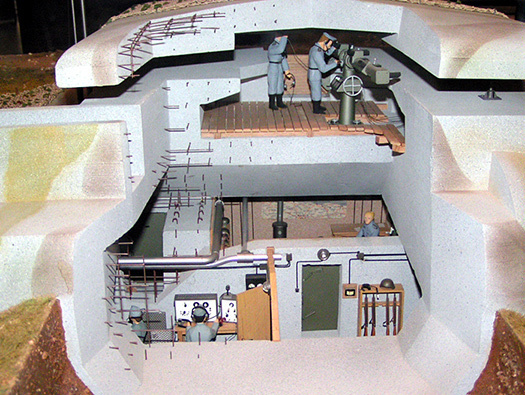 A model of an M262. This gives an idea of what it would have looked like inside. Steps up to the observation room. The rear wall of the observation room. Close combat window covering the entrance. Any enemy trying to enter via the rear entrance would have met with a hail of Mg34. The large hole underneath was to allow for equipment to to passed in, items that could not have come in via the doors. 483P2 close combat defence window that possibly should have been fitted here. Communications cables possibly to the three casemates. Casemate Turm 3 15cm Tbts.K.L./45 15cm ships or submarines main gun. Casemate Turm 3 the only part of the casemate that you can see is the rear entrance. A large block of concrete with access either side as the plan below. Rear entrance where two sets of steps either side join into a passage into the gun room with shell and case rooms either side. The passage with the two ammunition rooms either side..
M272 Casemate Turm 1 totally destroyed and just a crater left. 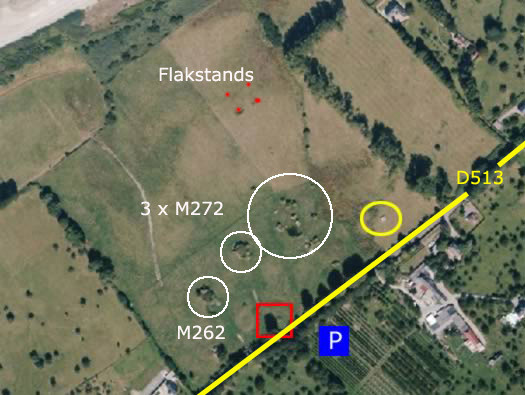 It may be that the British piled all the ammunition into Turm 1 and when MEK * 60 attacked the battery. It must have been one hell of an explosion. 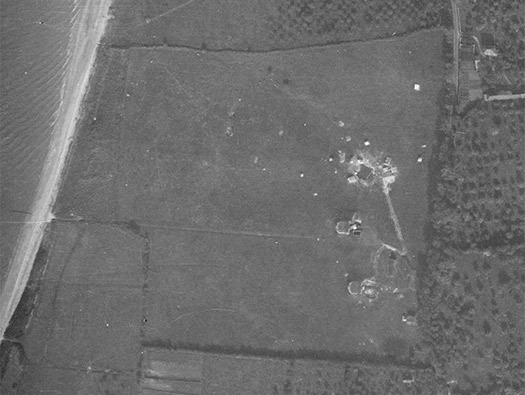 M272 Casemate Turm 1 from the air. You can still see the large crater now a pond. Very little known story that took place at the MKB Vasouy after the German retreat and the occupation of the battery by the English: the sabotage of guns by a group of German combat divers to avoid the English use of the guns, abandoned intact according to my source able still to shell Le Havre, still held by the Germans. 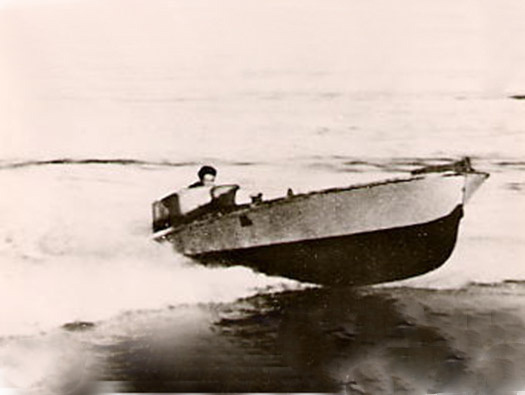 On August 26, 1944, probably at night (my source does not specify), a group of German combat divers MEK * 60 including its leader, the Oblt.MAdR Prinzhorn and 7 men slipped into MKB Vasouy. M.E.K. 60	Le Havre / Rouen; Rhein-Front, Elbe-Front	Oblt.MA. Prinzhorn (Hans-Friedrich)	03.44 - 11.44 03.45 - Ende. A frogman of M.E.K. 60. Ah the horses, whenever I have visited these guardians of the bunkers have kept me at bay.